Abdi, A., Izadkhah, M., Karimi, A., Razzaghi, M., Moradkhani, H. (2018). Application of artificial neural network in deoxygenation of water by glucoseoxidase immobilized in calcium alginate/MnO2 composite. Iranian Journal of Chemical Engineering(IJChE), 15(3), 82-93. A. Abdi; M.Sh Izadkhah; A. Karimi; M. Razzaghi; H. Moradkhani. "Application of artificial neural network in deoxygenation of water by glucoseoxidase immobilized in calcium alginate/MnO2 composite". 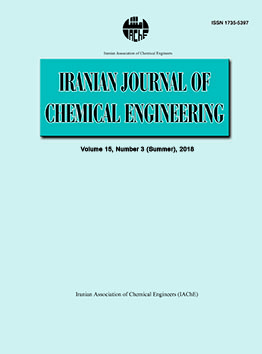 Iranian Journal of Chemical Engineering(IJChE), 15, 3, 2018, 82-93. Abdi, A., Izadkhah, M., Karimi, A., Razzaghi, M., Moradkhani, H. (2018). 'Application of artificial neural network in deoxygenation of water by glucoseoxidase immobilized in calcium alginate/MnO2 composite', Iranian Journal of Chemical Engineering(IJChE), 15(3), pp. 82-93. Abdi, A., Izadkhah, M., Karimi, A., Razzaghi, M., Moradkhani, H. Application of artificial neural network in deoxygenation of water by glucoseoxidase immobilized in calcium alginate/MnO2 composite. Iranian Journal of Chemical Engineering(IJChE), 2018; 15(3): 82-93. A three-layer artificial neural network (ANN) model was developed to predict the remained DO (deoxygenation) in water after DO removal with an enzymatic granular biocatalyst (GB), based on the experimental data obtained in a laboratory stirring batch study. The effects of operational parameters such as initial pH, initial glucose concentration and temperature on DO removal were investigated. On the basis of batch reactor test results, the optimum value of operating temperature, glucose concentration and pH were found to be 30oC, 80 mM and 7, respectively. After back-propagation training, the ANN model was able to predict the remained DO with a tangent sigmoid function (tansig) at hidden layer with 7 neurons and a linear transfer function (purelin) at the output layer. The linear regression between the network outputs and the corresponding targets were proven to be satisfactory with a correlation coefficient of 0.995 for three model variables used in this study. A. B. M. association, Handbook of power, utility and boiler: Terms and phrases, 6thed., PennWell Books, (1992). Butler, I. B., Schoonen, M. A. and Rickard, D. T., “Removal of dissolved oxygen from water: A comparison of four common techniques”, Talanta, 41, 211 (1994). Sinha, V. and Li, K., “Alternative methods for dissolved oxygen removal from water: A comparative study”, Desalination, 127, 155 (2000). Shao, J., Liu, H. and He, Y., “Boiler feed water deoxygenation using hollow fiber membrane contactor”, Desalination, 234, 370 (2008). Ito, A., Yamagiwa, K., Tamura, M. and Furusawa, M., “Removal of dissolved oxygen using non-porous hollow-fiber membranes”, Journal of Membrane Science, 145, 111 (1998). Tan, X., Capar, G. and Li, K., “Analysis of dissolved oxygen removal in hollow fibre membrane modules: Effect of water vapour”, Journal of Membrane Science, 251, 111 (2005). Vuorilehto, K., Tamminen, A. and Ylasaari, S., “Electrochemical removal of dissolved oxygen from water”, Journal of Applied Electrochemistry, 25, 973 (1995). Karimi, A., Mahdizadeh, F., Salari, D. and Niaei, A., “Bio-deoxygenation of water using glucose oxidase immobilized in mesoporous MnO2”, Desalination, 275, 148 (2011). Sellés Vidal, L., Kelly, C. L., Mordaka, P. M. and Heap, J. T., “Review of NAD(P)H-dependent oxidoreductases: Properties, engineering and application”, Biochimical et Biophysica Acta (BBA)- Proteins and Proteomics, 1866, 327 (2018). Shoaebargh, S., Karimi, A. and Dehghan, G., “Performance study of open channel reactor on AO7 decolorization using glucose oxidase/TiO2/polyurethane under UV-vis LED”, Journal of the Taiwan Institute of Chemical Engineers, 45, 1677 (2014). Bankar, S. B., Bule, M. V., Singhal, R. S. and Ananthanarayan, L., “Glucose oxidase: An overview”, Biotechnology Advances, 27, 489 (2009). Cao, L., Carrier-bound immobilized enzymes: Principles, application and design,ed. John Wiley & Sons, p. 1 (2006). Tzanov, T., Costa, S. A., Gübitz, G. M. and Cavaco-Paulo, A., “Hydrogen peroxide generation with immobilized glucose oxidase for textile bleaching”, Journal of Biotechnology, 93, 87 (2002). Dai, Z., Ni, J., Huang, X., Lu, G. and Bao, J., “Direct electrochemistry of glucose oxidase immobilized on a hexagonal mesoporous silica-MCM-41 matrix”, Bioelectrochemistry, 70, 250 (2007). Libertino, S., Scandurra, A., Aiello, V., Giannazzo, F., Sinatra, F., Renis, M. and Fichera, M., “Layer uniformity in glucose oxidase immobilization on SiO2 surfaces”, Applied Surface Science, 253, 9116 (2007). Tasviri, M., Rafiee-Pour, H. -A., Ghourchian, H. and Gholami, M. R., “Amine functionalized TiO2 coated on carbon nanotube as a nanomaterial for direct electrochemistry of glucose oxidase and glucose biosensing”, Journal of Molecular Catalysis, B: Enzymatic, 68, 206 (2011). Zhu, L., Yang, R., Zhai, J. and Tian, C., “Bienzymatic glucose biosensor based on co-immobilization of peroxidase and glucose oxidase on a carbon nanotubes electrode”, Biosensors and Bioelectronics, 23, 528 (2007). Zhang, S., Wang, N., Niu, Y. and Sun, C., “Immobilization of glucose oxidase on gold nanoparticles modified Au electrode for the construction of biosensor”, Sensors and Actuators, B: Chemical,109, 367 (2005). Landoulsi, J., El Kirat, K., Richard, C., Sabot, R., Jeannin, M. and Pulvin, S., “Glucose oxidase immobilization on stainless steel to mimic the aerobic activities of natural biofilms”, Electrochimica Acta, 54, 133 (2008). Sisak, C., Csanádi, Z., Rónay, E. and Szajáni, B., “Elimination of glucose in egg white using immobilized glucose oxidase”, Enzyme and Microbial Technology, 39, 1002 (2006). Dursun, M. and Özden, S., “An efficient improved photovoltaic irrigation system with artificial neural network based modeling of soil moisture distribution: A case study in Turkey”, Computers and Electronics in Agriculture, 102, 120 (2014). Ghavipour, M., Chitsazan, M., Najibi, S. H. and Ghidary, S. S., “Experimental study of natural gas hydrates and a novel use of neural network to predict hydrate formation conditions”, Chemical Engineering Research and Design, 91, 264 (2013). Razbani, O. and Assadi, M., “Artificial neural network model of a short stack solid oxide fuel cell based on experimental data”, Journal of Power Sources, 246, 581 (2014). Sorsa, T. and Koivo, H. N., “Application of artificial neural networks in process fault diagnosis”, Automatica, 29, 843 (1993). Zendehboudi, S., Ahmadi, M. A., James, L. and Chatzis, I., “Prediction of condensate-to-gas ratio for retrograde gas condensate reservoirs using artificial neural network with particle swarm optimization”, Energy & Fuels, 26, 3432 (2012). Aber, S., Amani-Ghadim, A. and Mirzajani, V., “Removal of Cr (VI) from polluted solutions by electrocoagulation: Modeling of experimental results using artificial neural network”, Journal of Hazardous Materials, 171, 484 (2009). Hamed, M. M., Khalafallah, M. G. and Hassanien, E. A., “Prediction of wastewater treatment plant performance using artificial neural networks”, Environmental Modelling & Software, 19, 919 (2004). Yetilmezsoy, K. and Demirel, S., “Artificial neural network (ANN) approach for modeling of Pb (II) adsorption from aqueous solution by Antep pistachio (Pistacia Vera L.) shells”, Journal of Hazardous Materials, 153, 1288 (2008). Abdi, A., Karimi, A. and Razzaghi, M., “Continuously deoxygenation of water in a reactor packed with glucose oxidase immobilized in MnO2/calcium alginate composite”, Journal of Environmental Chemical Engineering,4, 2356 (2016). L'Hostis, V., Dagbert, C. and Féron, D., “Electrochemical behavior of metallic materials used in seawater-interactions between glucose oxidase and passive layers”, Electrochimica Acta, 48, 1451 (2003).